To help apply the standards in specific circumstances, standards and related interpretations are arranged by subject with amendments noted, superseded portions deleted, and conforming changes reflected. 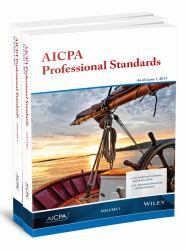 This edition includes the clarified attestation standards in SSAE No. 18 which became effective on May 1, 2017, and, Attestation Standards: Clarification and Recodification, issued in April 2016. The Auditing Standards Board has redrafted the standards in accordance with the clarity drafting conventions and differentiated them from the pre-clarity standards with the AT-C, identifier. The addition of objectives and definitions in each AT-C section and separation of requirements from application and other explanatory material makes the attestation standards easier to read, understand, and apply. Additionally, a new attestation interpretation describes conditions for practitioners who wish to perform and report on an attestation engagement in accordance with AICPA attestation standards in addition to another set of attestation standards.